in red what i found the key values to watch out for each product. 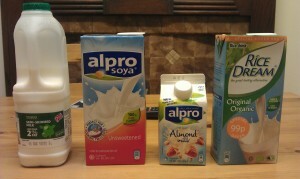 i drink cow juice most of the time, but when the going gets tough i will fall back onto the soya alternative. 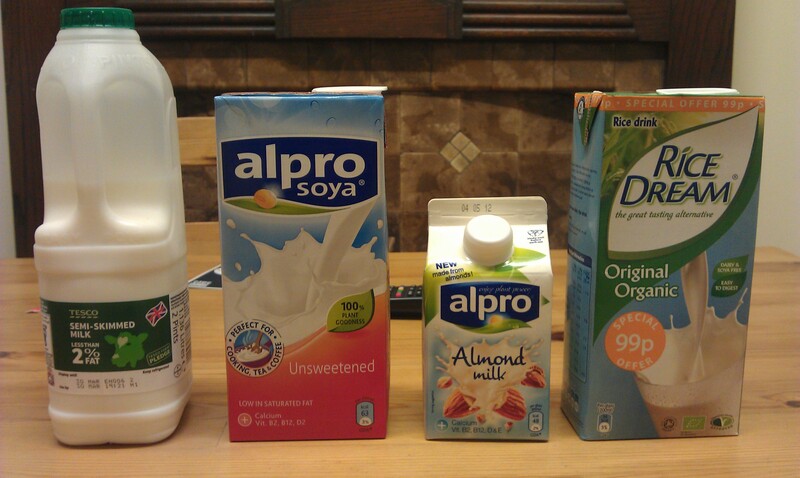 for a little while i was drinking oat milk as my stomach got a bit upset from the amount of cow i was drinking. then i realised how poor it was in protein. for body builders, protein is king. however, for me protein and energy are king. protein alone will only take you so far if like me you have a fast metabolism. the trick is to get your daily dose of protein and more, and also your daily energy intake. without it, yes you have muscle building bricks, but your body fuel is running on empty. no mortar = no wall. no energy = no muscle growth. – cow juice has the highest energy levels and protein content. this comes at a price, the sugar level is also fairly high. – soya has a lot less energy (its sugar content is rather minimal) but a VERY decent amount of protein. – almond and rice. hum. protein is extremely low, but sugars… oh boy. so soya all the way for ppl who are less active and on a diet. me, i will remain on cow for the foreseeable future. at least until the day i become lactose intolerant. Written by: zaki on 23/03/2012. This entry was posted on 23/03/2012. It was filed under Nutrition and was tagged with milk, milk alternatives. It should be noted that the nutritional values for the soya milk are for unsweetened soya milk, the sweetened varieties will most likely be much higher in sugar. The nutritional values may also vary from brand to brand, so it’s always worth checking what you’ve got. agreed. thanks for pointing that out.